In February 2000, while excavating his property in St. George, Utah, Sheldon Johnson turned over a piece of ground and discovered a fully preserved dinosaur footprint. That track was the first of many fossils to be uncovered. Five years later, the St. George Dinosaur Discovery Site at Johnson Farm was established to preserve one of the richest and oldest dinosaur-age fossil sites in Utah. 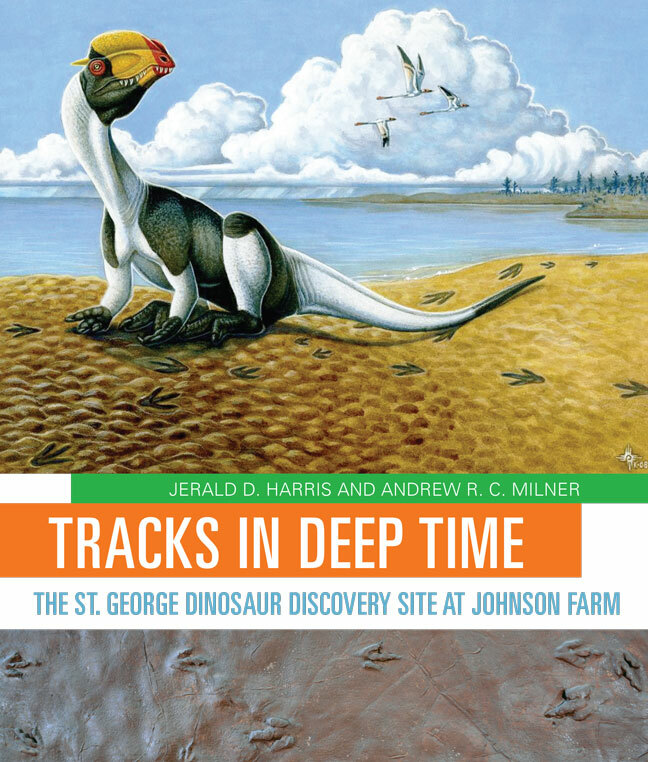 Tracks in Deep Time presents, for the first time, an engaging, thoroughly readable account of the history, geology, and paleontology of this important site. Two hundred million years ago, Lake Dixie covered the site. Within its waters and along its shores, a diverse ecosystem of dinosaurs, early crocodylians, fishes, plants, and other organisms thrived, leaving behind thousands of footprints and other fossils preserved in layers of rock. Unusual fossils found here include the world’s largest collection of tracks left by swimming dinosaurs and one of only six traces known to have been made by a sitting, meat-eating dinosaur. With approachable text and lavish, full-color photographs and illustrations, Jerald Harris and Andrew Milner describe how geologists and paleontologists have painstakingly reconstructed a vivid “snapshot” of life from the Early Jurassic epoch. Jerald D. Harris is the director of paleontology at Dixie State University in St. George, Utah, and is an advisor to the Dinosaur Discovery Site at Johnson Farm. Andrew R. C. Milner is the site paleontologist and curator at the St. George Dinosaur Discovery Site at Johnson Farm. He has been at the site since its inception and now runs the museum’s preparation laboratory and conducts field work in southern Utah.